Many businesses today will drop a few thousand dollars on a website and then it will just sit there and look pretty with no return on investment. Web design as a pre-packaged service has been referred to as a commodity. The only difference from one web designer to another is the price they charge. The website they deliver will be exactly that, a website. “Websites” have a standard market price that customers are willing to pay, so web designers fight to the death to win a contract by lowering their price to beat out the other’s proposal. This is when nobody wins, the designer gets paid next to nothing, the customer gets a low quality product. But hey, it was cheap! 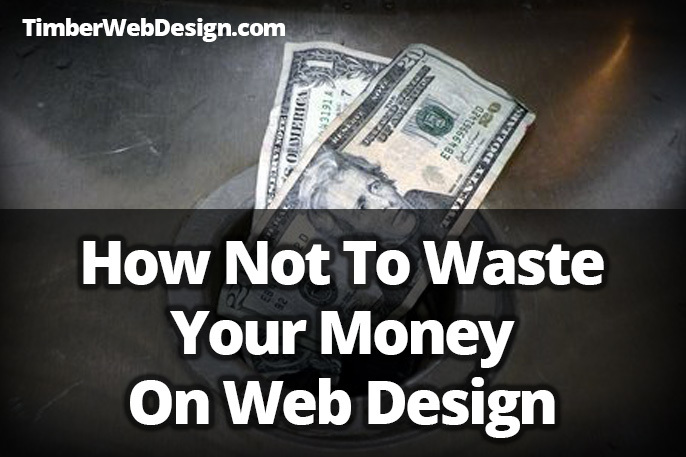 Going to the lowest bidder in a website is not what you need, it would be a waste of your money. Think about it, what is the main point of you needing a website? You probably are looking for more sales or more leads. If so, then this is what the investment should be in, not just a website. Look for a web designer that will understand your business and goals, one that will care and have the knowledge to help you reach your goals, not just deliver a pretty website. A lot goes into designing a website that will deliver the needed results. The objective and marketing strategy have to be considered and before the design phase even begins. Sitting down with the designer (or getting on the phone or Skype), and discussing the goals and plans you have for your business. This is where most of the information will be exchanged about what needs to be done. Making sure this phase of the project does not get neglected, will ensure that it starts on good foundation and runs smoothly throughout the process. Considering the marketing strategy in the design is also very important because this is how the objective will be achieved. Having the right landing page or a sales page, designed for the specific marketing campaign, will increase the conversion rates and make more sales or capture more leads. Keeping an eye on the goal while the design and development is in process, comparing and verifying against the plan and the making sure everything is on track, is the job of the web designer that you hire. Lots can happen during the development process that can deviate from the plan, so the objective needs to be in focus and high in priority at all times. When hiring a web designer, make sure to include unforeseeables in the quote. Give your self the flexibility to change things as the project is in the middle of development. The designer will no include this in the quote unless you request it. Without this flexibility, you will be stuck with what has been outlined in the contract and any changes will be considered “scope creep”, which designers do not like and it is not a good place to be in while the work is going on. Everyone needs to be focused and moving towards the goal. This is another item that you may consider to make sure to get included in your quote. After all is said and done, you will have a shiny new website that is optimized as a Formula 1 race car. You launch it, run your marketing campaigns, and issues come up, sales pages need to be reconfigured, funnels re-routed. You need your web designer to help you with all of this, on the fly. Don’t lose momentum and reserve the web designer to be there when you need them during the launch process. This can be done in the same quote with the website design, or as a separate contract. Either way you do it, make sure to consider this post-launch possibility. Having these things in mind when you hire a web designer, will ensure you do not waste your money on a website, but invest in an asset that brings returns on investment. Have questions or comments about any of this? Leave them in the comments below, and I will do my best to answer them.